`Sachin Out Ho Gaya`, get back to whatever you were doing – were the lines not far back. Until the Kohlis, Rohits and Dhonis of the world took some burden of his shoulders, this man, a certain Sachin Ramesh Tendulkar carried the hope and aspiration of a billion plus people for a good 20 years of his illustrious 24 years of Cricket journey. So unmatched, uncompromised and unadulterated his career was it at times looked unreal. Every time this man walked to the crease it was the hope of millions that walked alongside him. He succeeded many times and failed at other but the aura that Sachin always accompanied with him will remain for generations to admire, enjoy and feel proud of. I am a small man to write about this legend; a man with impeccable humility and above all a great humble human being. I am seeing him since the time I was only 10 and after 24 years, it feels, it still isn`t enough. Such is the qualities of this man and his enviable track record. I am not here to write my favorite memories of Sachin Tendulkar as a Cricketer since they are almost uncountable in numbers. An attempt at listing them all would make me carry on writing this piece for good six months and still I would be half way through. I rather here will pay tribute to the man who stood as a testimony to many things that world doesn`t associate India with. In the region of acute inefficiency he was the perfection personified; in a nation struggling to compete with the rest of the world on many things he was world class; in a nation where there are more pain than joy he was the hope and little elation that brought smiles to millions; in the country of chronic shortages of everything he was the fountain of uninterrupted delivery; in a nation badly lacking consistency he was consistent for 24 long years and every time that is. How many of us remember the bouncer of Waqal Younus that hit him right where it hurts? A cripplingly bleeding 17 year old Sachin may have been shaken of his feet but he never lost his composer or at least he never showed that he was perturbed by what happened. Took some medical help, had a stich and stood up to face the same bowler the very next ball. And what a copybook cover-drive that followed. It raced to the boundary quicker than the speed it reached his bat. That is Sachin Tendulkar for you. That elegant cover-drive showed what material this young lad is made up of. More than that, it showed what we all Cricket lovers would be blessed to see for next 24 years. He didn`t disappoint us; did he? He played with the same passion as he did when he first burst in to the cricketing scene as a kid in every subsequent appearance of his. This is what geniuses are made up of. They don`t do things differently but do them at an unbelievable constancy. Be it Sharjah or the Hyderabad game where he failed by a hairsbreadth in pulling up a miraculous win for us; his commitment towards the game and the billion plus hope he always carried through is unquestionable. His love for the game is only evident from his teary eyes post 2011 world cup win. After achieving everything that one can imagine a cricketer to achieve, this man was still feeling the void of not having the world cup in his cabinet. That is perhaps why, when asked which particular shot of his he remembers most he said, I do remember many but the best of them is not from my bat but from that of Mahendra Singh Dhoni at Wankhede. Just imagine yourself representing something which is no less than a religion in the country and that too at the highest level. You know there is none before nor after you to do justice to an entire nation`s aspiration. You go out to perform knowing there would be millions eyes glued on you and another million breathless lungs waiting eagerly to comfort them with your first run. How challenging it is to perform year after year; game after game requires no explanation. But this man has done that quite consistently which speaks volumes of his love for the nation and his countrymen whose hope and joys are pitted on his performance. Nothing is out of bounds from criticism and Sachin was no exception either. From the funniest one from Imran Khan when he first saw him - `what are you doing on a Cricket pitch? Go you might be late for school` to the serious and shoddy ones like - `Sachin is greedy for his own records which is why he is still continuing`, I can count at least two dozen critics who had to eat crow over the last 24 years. 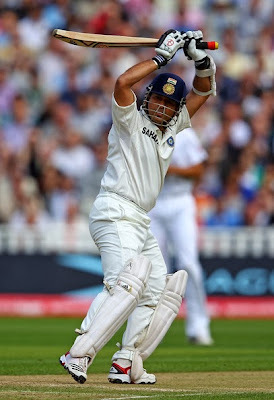 While criticisms were flowing from all directions Sachin let his bat to do the counter attack. That is perhaps why a long career of 24 years and yet people can`t pick a single sentence that Sachin ever spoke to be deemed as even remotely controversial. The critics, many of whom were former cricketers themselves got it squarely wrong when they lamented Sachin for blocking the path of promising players because of his greed. A man who has achieved everything on the Cricket field and there are rarely any record in Cricket which doesn`t belong to him; why on earth he will continue for his greed when he has got nothing to prove to anyone? I don`t know if Sachin made India win more matches or not. I don`t know if he is the greatest batsman ever to play this game or not. I don`t know if his records will stand the test of times or be broken someday. I don`t know if Sachin should have retired two years back when his form started to deteriorate a bit. Honestly I couldn`t care less. But what I know for sure is Cricket possibly can`t get a better ambassador of the game than this man. I know for certain, watching Cricket won`t be same again. I know retirement of Sachin is more than just end of an era; it is an end of an era of world-class batsmanship yet full with humbleness in every corner. How hipocrates we are..until few days ago all wanted him to retire and now the way we are giving him farewell..not sure its because he is retiring :) or he is retiring :( ! !